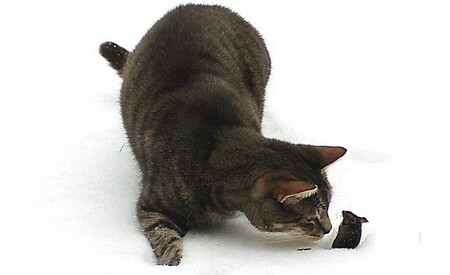 Most cat owners will assume that their cat knows how to chase and catch mice, attributing this behaviour to a cat’s natural instincts. However, a few cats can actually show fear and even run away from a mouse. If you want your cat to take on the role of mouser, there are ways of encouraging his hunting instinct. Equipment: Fishing-rod type of toy, treats. Training objective: To train your cat to demonstrate feline behaviour, and to exercise himself. Encourage your cat to sniff and play with a toy mouse or with a few feathers bound together. Lightly spray toy with liquid catnip or sprinkle a few flakes of dried catnip on to the toy. This will enhance acceptability. Once your cat has demonstrated that he will accept his toy, praise him and reward him with his usual treats. Next, attach the toy to a rod and piece of string. Drag the toy around the floor, calling your cat’s name at the same time. Using short, jerky movements with the rod, encourage your cat to start pouncing on the toy, which should smell faintly of catnip. The usual treat, reward and praise should be given at this stage. When your cat has mastered jumping on the toy in your home, transfer his training to your garden or an enclosed safe area. Pull the toy behind you as you run the length of your garden, calling your cat to follow you. After running for a few steps, stop to encourage him to pounce on his toy. Wriggle the rod around so it appears the toy is jumping about of its own accord. Gradually lengthen the time between stops, and your cat should soon learn that he has the time and opportunity to grasp his toy. Each time he runs to grasp his toy, praise him with his favourite food treats and a lot of praise.